As the kindled fire consumes the fuel, so, O Arjuna, in the flame of wisdom the embers of action are burnt to ashes. There is nothing in the world so purifying as wisdom; and he who is a perfect saint finds that at last in his own Self. He who is full of faith attains wisdom, and he too who can control his senses, having attained that wisdom, he shall ere long attain Supreme Peace. But the ignorant man, and he who has no faith, and the skeptic are lost. Neither in this world nor elsewhere is there any happiness in store for him who always doubts. But the man who has renounced his action for meditation, who has cleft his doubt in twain by the sword of wisdom, who remains always enthroned in his Self, is not bound by his acts. Of all the traditional holy books in the world, possibly none is held in higher regard by me than the Bhagavad-Gita. I hold it in such a high opinion that I was a little hesistant to start pulling quotes from it. After all, it is more or less fairly straight forward no matter what level of spiritual evolution you’re on (and one of the great features of the Gita is that each line holds truths for every level of enlightenment) and if you still need further discussion of the wisdom of Krishna as he speaks to Arjuna there are commentaries by Yogananda and other far wiser people like me. Still if I didn’t bring up anything from the Bhagavad-Gita it seemed like it would be an insult to such a divine book. So let’s talk about what the Gita means by Self. New Age and most Eastern religions make a needed distinction that the West so often ignores. The typical vision in the west is that you yourself are a rational being with free will and have the choice between two forces the positive forces of God and the negative forces of whatever you want to call the negative force (the more enlightened in the west will call it our negative nature, the less enlightened will give make a full blown opponent of God and call it the Devil.) This is best represented by the cartoon image of the angel and the devil on your shoulders. This view could not be more wrong. The Eastern/New Ager view is more that you are composed of your self and your ego* (which actually doesn’t exist, we’ll get to that later). Now for all of your ego’s lacking qualities it is quite cunning and it has convinced you of two three very important lies. It has convinced you that you and the angel on your shoulder are two different beings…this is silly because you, your Self, is a part of God an infinite and divine being, and you, your Self, is a part of all that is good. You and the angel on your shoulder are the same being. The next thing the ego did to you was that it convinced you that it was you, that all of it’s thoughts are your thoughts, that’s it’s fears and doubts are yours. And finally it created the image of the devil on your shoulder an outside enemy. To distract you from all of it’s fearful and destructive thoughts being against your best interest it gives you the idea that there is some outside force that is your enemy, a devil on your shoulder, an outside enemy to distract you from the real one. Learning to do away with your ego is the final lesson of the cycle of rebirth. It’s a hard lesson…if it weren’t you wouldn’t have 6 billion souls on this planet. But it’s a easy lesson, all you have to do is accept the truth: I am a part of God. I am holy. All you have to do is believe it. Yeah I know, easier said than done. But let’s start with something easy. If it is from the best it is from mutual voice of your soul and God working in tandem. If not, it is likely the voice of your ego. Ignore. You’ll miss some negative thoughts, you’ll give in. Don’t chide yourself for it, self-deprecation of that sort is a weapon of the ego to make you hate yourself. Just worry about the ones you do catch. When you catch them, recognize their source and ignore them. Try only to listen the voice that tell you that you will and you should achieve your dreams. That you are worthy. That you are beautiful. Listen to that voice. Learn to recognize the other voice so you can ignore it. Will this solve all you problems? No. But it’s a start. *Don’t confuse the Eastern/New Age idea of the ego, the miscreation of fear and hatred that is a part of your psyche, with the traditional meaning of the word as arrogance or mere sense of self. 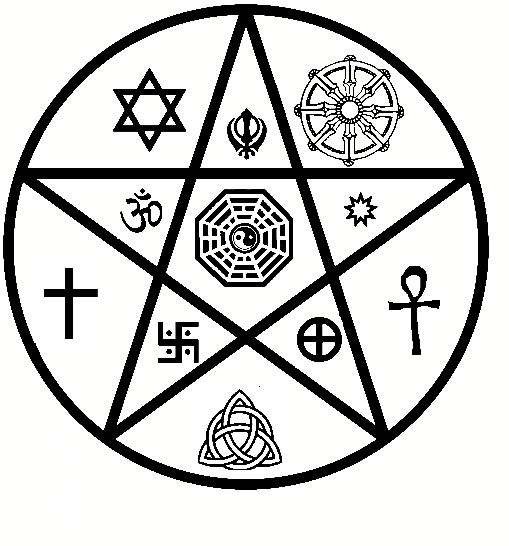 Remember each one of these symbols is telling you are you are a part of God and divine…maybe you should listen.